Italy’s Ministry of Agricultural, Food and Forestry Policy (Mipaaf) has announced a deal has successfully been completed to regain access to the Canadian table grape market, which was blocked in 2010. In a release, Mipaaf said the agreement follows the successful outcome of evaluations from Canadian phytosanitary experts who visited the country in October last year. The inspectors visited fields in the southern Italian regions of Basilicata, Puglia and Sicily. In summary, the ministry said producers and exporters interested in shipping to Canada would undertake the necessary steps. “This is a major achievement for the whole Italian table grape sector, and is the fruit of the work of the Ministry of Agricultural, Food and Forestry Policy in close cooperation with producer associations and regional institutions,” Mipaaf said. While Peru’s grape exports have “skyrocketed’ in recent years, the country needs to overcome nematode problems. Over 100 Hector ( 1 million Square meters) Land in Pune is available for contract farming of specialized export oriented Grapes, Cranberries and wide range of fruits. The land is fertile and has various agro benefits available for exports. Awe Sum Organics, one of the largest importers of organic apples and organic kiwifruit in North America, has just kicked off the second season of their exclusive organic Peruvian grape program. The first organic green seedless Sugraones arrived in mid-November, and quality reports have been outstanding. These grapes have been in development since early 2007 when David Posner, Founder and CEO of Awe Sum Organics, dreamed of creating an organic grape program in the winter months to compliment the domestic grape season. David and his team are very excited to see the second harvest season of this Awe Sum project begin. “The bunches of our organic Sugraones have a nice shape with large berries and are incredibly sweet, crisp and flavorful,” says David. Awe Sum Organics plans to start shipping organic Red Crimson seedless grapes by mid-December. The harvest was underway in Peru two weeks ago when Mr. Posner travelled to the vineyard to see the fruit in the field, the current harvest, and the fruit being packed in the new state-of-the art packing facility. “Our Crimson Seedless have a beautiful color and also great flavor, with a smaller berry size than our Sugraones,” said Mr. Posner. The total volume of the Crimsons will be much more limited than the Sugraones, and the crop will have a shorter window. One of the aspects of the program that Awe Sum Organics is most proud of is the fact that they are Fair for Life certified by IMO Switzerland as well as 100% of their organic grape production. Fair for Life certification guarantees fair wages, good working conditions and social responsibility at each and every stage of production and throughout the distribution chain. Since 1985, Awe Sum Organics has been a leader in the organic movement. “Throughout our growth, we have remained dedicated to the principles on which Awe Sum Organics was founded. In addition to outstanding taste and quality, our fruit embodies core ethics which we will never compromise. We believe in doing what is right for humankind, and the environment as a whole,” said David. Each Awe Sum Organics grape carton is an 18lb minimum, containing 12 zipper bags. South Africa’s table grape crop is expected to be up on last season by 4-7%. Last season the country had to deal with adverse weather which affected volumes, this season’s volumes are more online with the volumes from the 2012/13 season and will be boosted by new planting coming into production. According to Rhomona Gounden from SATI, harvesting will begin seven days earlier than normal. the total volume is expected to be between 52.9 and 54.3 million (4.5 equivalent boxes). A few weeks ago the Orange River Region suffered from hail storms, despite this the volumes are expected to increase from 15 million carton last season to 16.5-16.8 million cartons this year. An updated second crop estimate will be published early December 2014. As availability of tree fruit in California winds down, the relatively empty market has made for good movement and a strong market for grapes. “Compared to this time last year, prices are probably one to two dollars higher,” noted George Matoian of Visalia Produce. “Compared to a month ago, prices are about one to two dollars higher per box.” At the end of last week, prices for table grapes out of the Central Valley ranged from between $ 14.95 to $ 22.95 per box, depending on variety, size and colour. He credited a relatively clear market for the prices, since there’s little competition from tree fruit at this point in the season. He also believes the market could get even stronger in the coming weeks. “I think we’ll see increased prices as we get into October and November,” said Matoian. “We’ll see an increase in the fall months, it just depends on the pack-outs. We still have a long way to go.” Varieties currently available include Scarlet Royal, Crimson, Vintage Red, Thompson, Autumn King, Autumn Royal and Red Globe grapes. Availability of California grapes is expected to stretch into January. Though Asia is the continent to which the most grapes from California are shipped, there is still much potential for growth. A booming population and a rising middle class, especially in China, makes the region very attractive for California’s grape shippers. “Out of the top 15 export markets we have, 10 of them are in Asia,” said Susan Day, vice president of the California Table Grape Commission at last week’s Asia Fruit Logistica. “So it’s a significant market that is still offering lots of potential for growth.” She pointed to China, which is the second biggest destination for California grapes, only behind Canada, as a prime example of the growth potential in Asia. “China has a lot of people and shows a lot of growth,” said Day. “Along with the population increasing, the middle class is also increasing, and that gives more people the opportunity to enjoy grapes from California.” But opportunities in the region for shippers are not limited to just China. California grapes find their way to many Asian countries, and all of the countries that import those grapes import the top 15 varieties grown in the state. That means that not only are many of the top importers of California grapes in Asia, and not only are those countries spread out through the continent, but those countries are also interested in the plethora of varieties California’s growers offer throughout the season. The commission is looking to take advantage of that potential. IG International’s Tarun Arora looks at the Indian crops to benefit from Russia’s import ban, and how the move will affect European and Middle Eastern growers’ orientations toward his country. “After a slow start due to the poor quality of Victoria grapes, better quality bunches will be available on the market from the first week of August,” explains the manager of Orchidea Frutta, a company specialised in the production and sale of table grapes, cherries, citrus fruit, peaches, apricots, watermelons and artichokes. “We started harvesting the Superior seedless variety, but abroad we are currently affected by competition from Spain.” A good year is also expected for Crimson Seedless, especially thanks to the 30% drop in production with respect to last year. It is not easy being a farmer anywhere, and it has certainly not been easy in recent years to be a grape grower in California in the face of a plethora of challenges, ranging from drought exacerbated by government-imposed limitations on agricultural water use to rising labor costs and a maze of ever-intensifying regulatory pressures. Yet thus far, California grape growers have been able to meet the challenges and turn out ever-increasing volumes of high-quality grapes in an expanding array of varieties. Plantings of Scarlet Royal red seedless grapes, a relatively new variety, have increased significantly in California’s San Joaquin Valley in recent years for the mid- to late season. (Photo courtesy of Sundale Sales)Last year was a record year for California grape shipments, with a record 116.2 million boxes of grapes (19-pound equivalent) going to market. For 2014, the crop was officially estimated at just over that — 116.5 million boxes — at the season’s start. The California Table Grape Commission revisited the estimate at its meeting on July 17 and reaffirmed that number, notwithstanding some early vineyards in the San Joaquin Valley picking out a little lighter than growers had anticipated, attesting their confidence that if all went as expected, strong volumes would be realized throughout the balance of the season. In the San Joaquin Valley, California’s largest grape growing region, the 2014 harvest started earlier than usual — earlier than ever for some growers — with varieties coming off from one week to as much as two weeks earlier than average. However, many growers quickly discovered that for a variety of reasons the volume was not there in the early vineyards that they had anticipated. Some growers had smaller bunches than they expected, and many found the berries were not sizing as well as the year prior. However, the quality of the harvested fruit, they say, has been excellent. How the trend would play out over the course of the season remained to be seen, as the preponderance of the volume was still ahead. California’s fresh grape volume is increasingly skewed to the latter part of the season. Most new varieties being introduced are mid- to late season varieties, and most new plantings have been for the latter part, rather than the earlier part, of the season. Growers attributed the lighter-than-anticipated production on some early vineyards to various factors, including a mild winter and some intense summer heat. “Overall, the crop looks good. Size is good” and the color is good, said Anthony Stetson, sales manager at Columbine Vineyards in Delano, CA, July 2. “I’d say the heat we are having this week has slowed everything down considerably,” largely because harvest crews were only able to work half a day in the heat, he said. “Demand has stayed pretty good” right through the Fourth of July pull, he added. 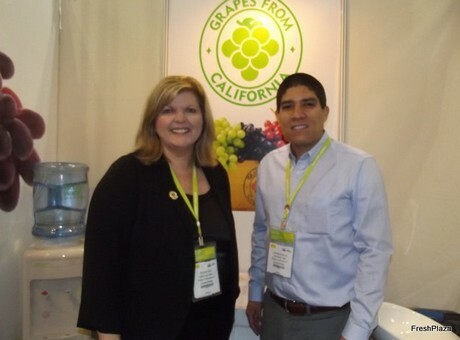 “The quality is outstanding this year, and it has been a seamless transition out of Mexico to the Central California deal on red grapes,” said Atomic Torosian, a partner in Crown Jewels Produce LLC in Fresno, CA. “Up here in the Central Valley,” he said, he has seen “good berry size and nice firm grapes. So far … it has been a real good deal.” He expected markets to remain active at least through the month of July on all colors of grapes. The crop is neither light nor heavy but “a good solid crop of grapes this year,” according to Scott Boyajian, director of sales for Sunview Marketing International in Delano, CA, July 3. He expected the total California crop to come in “somewhere between 117 and 120 [million boxes],” which is a bit over the official estimate. “Water has been a big issue in the valley,” said Brian Crettol, a salesman at Jasmine Vineyards Inc. in Delano, CA, July 9. “We are basically getting zero allocations” for surface water this year, “so it is all well water.” Seeing that coming, the company put in new wells and retrofitted old wells “to make sure we have a steady water supply.” However, continued drought conditions could be problematic, as water tables have been dropping. Rainfall is needed to recharge the aquifers, he said. Earliness has advantages, but “I’ll take quality and consistency over that just about any day,” he said. The Produce News | Today’s Headlines – The Produce News – Covering fresh produce around the globe since 1897. Several weeks of high temperatures in California’s Central San Joaquin Valley have affected table grapes in the region. The heat has had an effect on the sugar content, maturation and colouring. High temperatures in the valley have reached or topped 100 degrees for most of the month of July, and that intense heat has sped up fruit maturation. The lack of water the state’s growers have had to deal with has also compounded the situation. As Nick Dulcich, of Sunlight International, explained, the drought means there’s less water for vineyards, and dry conditions in the fields have augmented the heat’s effects. “We usually run water down the furrow in the middle of the rows and get grass growing in between,” said Dulcich. “But because we have less water due to the drought, the soil is dry in the field and there’s no absorption of that heat, so it’s just pure heat on that dirt. It’s stopped the colour, it’s advancing the sugars and some varieties are coming abnormally early.” He pointed to the Princess variety as an example of the effects of the heat. While that variety doesn’t usually come on until August, this year Sunlight will be done with the Princess by July 22 – a full two weeks before it’s usually available. In addition to speeding up maturity, the heat has also been upping sugars. “Brix for Summer Royal grapes are usually around 18 or 19,” noted Dulcich, “but we’ve measured them at 27 this year, which is unheard of.” While sugars may be up, the timing to get good colouring on the grapes has been thrown off. Some Valley growers are in a race against time. The heat is ripening grapes on the vine while labourers work shorter hours because of the high heat. Bright reflective foil strips fly over a Madera vineyard to keep the birds away from the red flame seedless grapes. Fortunately the grape crop was healthy and heavy. Shackelford said the red flame harvest started a little early this year. In another week all of the bunches will be a nice red colour because of the intense heat. Shackelford added the hot streak will damage some of her varieties. The red flames are sold locally at The Market and Whole Foods under the Robert Johnson Farms label as well as the Jenelle brand, which combines the names of Michelle and her sister Jennifer. Please click here to view the video report. Products listed in Searches is not sold by us. We only offer Consultancy & Data services to Importers/Exporters.